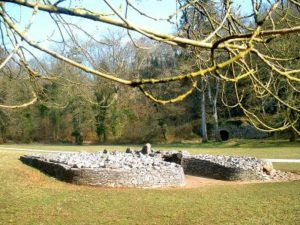 This well preserved Neolithic long barrow tomb (SS 537 898) is known by a variety of names (just like the valley in which it stands), including the Long Cairn, Parc le Breos Tomb, Parl Le Bruce Burial Chamber and Parc Cwm Long Cairn. It’s most commonly used name though is Giant’s Grave. 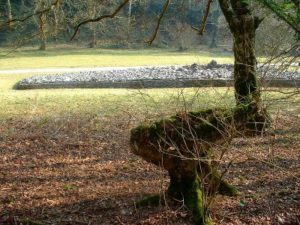 A classic example of a ‘Severn Cotswold’ Neolithic tomb, the site dates as far back as 3,500 BC and consists of a long mound of stones (of local origin) with a deep forecourt at its southern extremity. A slab lined passage dissects the monument, interrupted by two pairs of side chambers. These would have originally been roofed over with further slabs but now lie open for public view.